The Hilb Group’s HR Consulting division eases the growing demands on your organization by working collaboratively and seamlessly as an extension of your in-house team. From all-inclusive solutions to a custom package of options, we can design a program to assist you in managing your most valued assets: your employees. You receive confidential guidance on HR issues, including discipline, terminations, harassment, performance management, record keeping, policies and procedures, management coaching, and compliance. We offer an HR Assessment of your organization’s compliance practices and procedures and identify noncompliant areas that need to be addressed. We provide you with the most current regional and national benchmark data to help you remain competitive. We regularly host compliance webinars and trainings and deliver legislative alerts and newsletters to your desktop. Our online resource offers you access to a policy library, job descriptions, HR forms, checklists, guides, letters, federal and state employment laws, HR podcasts and articles. If you have 50 or more employees and $50,000 or more in government contracts or subcontracts, we can create your Affirmative Action Plan and keep you in compliance. We can quickly and easily provide you posters that have been carefully researched and verified to meet your compliance needs. We make it easy for you to run background screens on candidates so you can hire the most qualified person. We offer assistance with recruiting, reference checking, downsize management, employee retention strategies, workforce planning, selection tools and HR metrics. We can create your employee handbook or provide a review of your current one. And we can keep your manual in compliance with our annual handbook update service. To enhance your employee development efforts, we offer customizable trainings on many topics, from harassment to human resource skills, for all levels. We offer executive coaching, leadership and talent development, high performing teams, strategic organizational change and culture development to maximize your organization’s potential. To help contain the increasing cost of healthcare, we conduct dependent audits to ensure that each spouse and/or child on your plan is truly eligible for coverage. We offer proven, on-site organizational development to promote successful change. Our highly individualized coaching gives your managers the advice and guidance they need to develop their skill set. 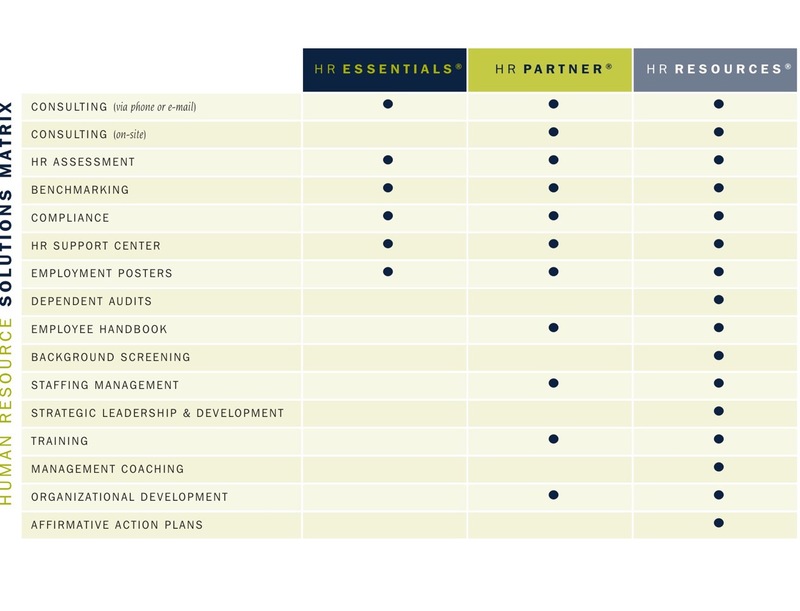 We offer the following programs to best meet your needs: HR Essentials®, HR Partner® or individual HR Resources®. Whatever option you choose, you get the same effective implementation, consideration of legal and ethical issues and prompt, personalized service from our professional staff. For a flat annual fee, we offer a support package of essential human resource services so you can get back to the business of running your business. To maximize your staff’s effectiveness, we offer on-site strategic guidance on a range of business, organizational and HR issues by day, week, month or year. For assistance with select human resource services, we offer our HR solutions as stand-alone options.